It’s been 70 years since one of the world’s worst anniversaries: On Aug. 6, 1945, at 8:15 a.m., the United States dropped the first atomic bomb, on its first victim – the city of Hiroshima. In an instant, some 80,000 people died. Three days later, on Aug. 9, a second, bigger atomic bomb, dubbed “Fat Man,” was dropped on the port city of Nagasaki. There, too, the casualties were equally horrific, with 40,000 people killed instantly; a final death toll was ultimately calculated at 50,000. In all, over a span of 3 days, the world’s first use of a nuclear atomic weapon in war left more than 135,000 people dead, all on Japanese soil. Years later, on the eve of America’s bicentennial birthday celebration, Japan offered a good will gift. A bonsai tree, more than 350 years old. The idea for the gift came from a Japanese man named Masaru Yamaki. On Aug. 6, 1945, the bonsai master was inside his home when glass fragments from shattered windows hurled past him. A bomb, christened the “Enola Gay,” had just dropped two miles from his family home, wiping out 90 percent of the entire city. The Yamaki family survived. 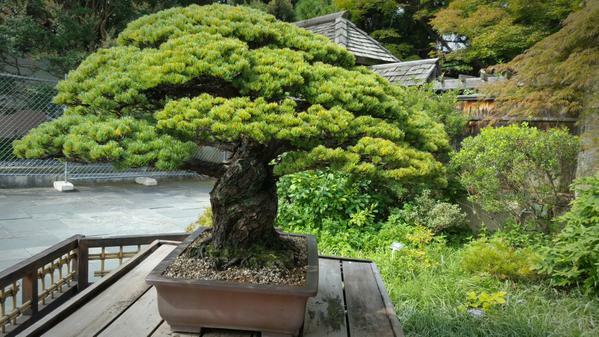 And so did their centuries-old bonsai, whose record of longevity stretched back to 1625. Today visitors can see this remarkable survivor at the National Arboretum in Washington, D.C. Walk down a pathway and you may almost miss it – the Yamaki Pine, in the museum courtyard.